Mr Green is celebrating their 10-year anniversary with a fantastic promotion where players can win a luxurious city break, free spins or a share of €5.000 cash! The city breaks include trips to New York, Orlando and Los Angeles! 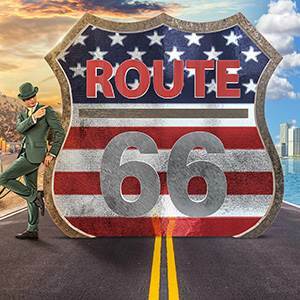 The slot games in the Route 66 collection give players free spins during the promotional period. You get 20 free spins for Starburst for every 200 rounds played at these slots, up to a maximum of 200 per day! For every 600 rounds played at the slots you'll get a ticket to the prize draw where you can win one of the 3 city breaks and a share of €5.000, which is divided in 17 cash prizes. You can earn as many tickets as you like, giving you the chance to win more than one prize, and the prize draw is held live on the 25th of May 2018 @ 19:00 CEST at Mr Green’s Exclusive Blackjack Table X. Promotional terms apply, please read full terms before participating. These include that free spins are valid for 7 days and winnings have wagering requirements of 35 times. This promotion is only for participants of over 18 years, and a Mr Green player account is required. Real money games only. Bonus T&Cs. Collect Free Spins and Tickets at Mr Green Now! As you may have gathered, Mr Green has been around for 10 years now - an impressive age for an online casino, that also shows that the operator is trustworthy and popular! They have a fantastic reputation with the players, especially for payment policies and fast processing times. You can also find hundreds of fantastic slots from many great developers, as well as tons of regular promotions that include prize draws, free spins promos and special slot promotions. You can read about everything the casino has to offer in our full Mr Green review.